The other night I was in the shower (the place where all my great epiphanies occur) and I was thinking about how I was a little bit frustrated with my two older kids. 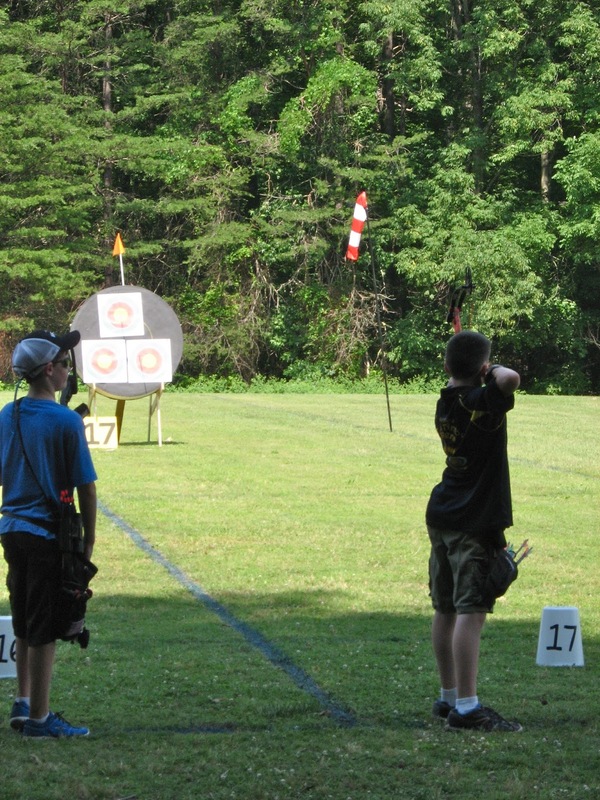 My son is the oldest, and he takes archery lessons, and is in fact on our local Junior Olympic Archery Development (JOAD) team. He practices with them once a week and periodically competes in tournaments. During the school year we had him on a regular home practice schedule of twice a week, but over the summer we've slacked off a bit. When he's competed in tournaments, he's always placed- 1st, 2nd, or 3rd. Some of those tournaments were entered in hopes (in MY hopes) that maybe he wouldn't do so hot and it would be a wakeup call for him. But so far that hasn't happened, because apparently, he's really naturally talented at archery and the pressure of a tournament just makes him even better. My boy in his last tournament- solid 3rd. So in the shower I couldn't help but think- How much better might he be if he were actually putting in the effort? I mean, just a little bit of effort each day with his strength training? I can only imagine how he might blow past the competition with ease. That would be really fun to watch, and even more fun for him to get to experience. Now my daughter. My daughter has been doing gymnastics for a year now. Like her brother, she seems to have a natural talent for her chosen sport, and moved up from the beginner's class after just 4 months and is now in the intermediate class. She loves gymnastics- at any given point in the day if she is not being forced to do something else, you'll usually find her practicing her handstands, cartwheels, round-offs, and splits in the living room. That's my girl there in the middle. But. The backbends. She just can't go from standing into a backbend. Her coach has talked with me about this and has shown us some stretches she can do to increase the flexibility in her shoulders (turns out that's where the issue is). But when she's bounding around the living room, do you think she stops to stretch out those shoulders? Nope. And it kills me- each week in class I watch her improve on the bars, improve on the beam, but when it comes to doing anything that requires those standing backbends- it's a precursor to the back handspring- she looks like she's back in the beginner's class. So that night in the shower I thought, What if she just did those stretches for just a few minutes each day? Just a little bit each day- such a simple thing- and I just KNOW she'd get it. Think of how much more fun it would be for her once she'd mastered that skill! And then, as the hot water ran down, I had that funny, kind of niggling feeling in the back of my skull, that feeling I have come to recognize as the Spirit, sort of jumping up and down raising his hand and saying, "Um, hey! Over here! Yoo-hoo! I have something to say about this!" I sighed (usually when this happens I've learned to expect that I'm about to have some kind of less-than-comfortable inner epiphany) and said, "Yes, you there in the back?" And he said, What about you? How are you not living up to your potential? As a mother, you can clearly see the small changes your children could make to live up to their potential. What small changes does your Heavenly Father wish that you would make to live up to yours? Here I was beholding the motes in my children's eyes without batting an eyelid at the beam that was in my own. And I'll bet you can guess what it was- writing. Well. That's hard to argue with. So for the school year (which starts next week) we are going to institute a family Talent Time- just 15 minutes a day during which we will each work to improve our talents and live up to our potential. My son will be strength training, my daughter will be stretching, and I will be writing. 15 minutes. That's all it takes to live up to your potential. What can you do for 15 minutes today? That is a beautiful application of this principle, Mare. Wow, what might we all accomplish spiritually if we just spent 15 minutes extra on our prayers each day? There is a fantastic book called, "A Year of Powerful Prayer"- it's an LDS publication but it has a quotation- almost a lesson, really- on prayer for each day of the year. Each day when I kneel down for my personal prayer I read an entry from the book and it reminds me of the power of prayer and teaches me how to make my prayers more meaningful. Kasey, I don't see an email anywhere on this site to contact you! I commented under my previous post that you had won a copy of my ebook, The 12 Days of Christmas Adventure. Please email me at ballpark001@gmail.com so I can get the proper format to you...a pdf file or e-reader? Email me! Woohoo! Thanks, Mare! You can always reach me on facebook too. I'll message you on there. Super inspiring...funny how we can focus so much on our kids potential that we forget our own. I needed this one....you're amazing. Thank you!